Flexor tendons with attached vincula. The forearm can be divided anatomically into anterior and posterior compartments. The anterior compartment contains the flexor-pronator group of muscles, most of which arise from a common flexor attachment on the medial epicondyle of the humerus. The 8 muscles of the anterior compartment may be divided further into 3 distinct functional groups, as follows: (1) muscles that rotate the radius on the ulna, (2) muscles that flex the wrist, and (3) muscles that flex the digits. The muscles that flex the digits include the flexor digitorum profundus (FDP), flexor digitorum superficialis (FDS), and the flexor pollicis longus (FPL). The FDP muscle is a long, thick muscle that originates from the proximal three fourths of the medial and anterior surfaces of the ulna and interosseous membrane. According to Moore, the FDP clothes the anterior surface of the ulna. Occasionally, a proximal attachment to the radius is present just distal to the radial tuberosity. As the single muscle belly of the FDP travels distally in the forearm, it separates into a radial bundle and an ulnar bundle. At the musculotendinous junction, the radial bundle forms the profundus tendon of the index finger. The ulnar bundle forms interdigitating slips that are covered by a single paratenon, ultimately forming the individual profundus tendons of the middle, ring, and small fingers. Motor branches from the C8 and T1 distribution of the ulnar nerve provide innervation for the ring and small finger muscle bellies. The anterior interosseous branch of the median nerve (C8 and T1) innervates the index and middle finger muscle bellies. The blood supply of the FDP muscle is made up of muscular branches from the ulnar artery, anterior interosseous artery, and common interosseous artery. Each tendon arising from the FDP muscle flexes the proximal interphalangeal (PIP) joint and the distal interphalangeal (DIP) joint. The FDS, as its name suggests, lies superficial to the FDP in the anterior compartment of the forearm. This muscle has 2 heads of origin in the proximal forearm. The ulnar head of the FDS arises from the medial epicondyle of the humerus and the medial collateral ligament of the elbow joint; a contribution from the coronoid process may also be present. The radial head arises from an area distal to the radial tuberosity. The FDS muscle forms 4 distinct bundles in the middle aspect of the forearm, each of which, in turn, forms 4 distinct tendons in the distal forearm. The tendons to the middle and ring fingers lie superficial to the tendons of the index and little fingers, a relationship that aids in their identification during surgery. Innervation to the FDS muscle is provided by the C7, C8, and T1 distribution of the median nerve. The arterial blood supply of this muscle is provided by branches of the artery of the median nerve, muscular branches of the ulnar artery, and, occasionally, branches of the radial artery. The FDS tendons to the index, long, ring, and small fingers insert into the respective middle phalanx of the digit. The primary function of the FDS is to flex the PIP joint. The FPL muscle lies lateral to the FDP muscle and originates from the midanterior aspect of the radius and adjacent interosseous membrane. The single muscle belly gives rise to 1 tendon, and it is innervated by the anterior interosseous branch of the median nerve (C8 and T1). The FPL inserts into the distal phalanx of the thumb, and its action is to flex the interphalangeal and the metacarpophalangeal (MCP) joints of the thumb. The anatomic relationships of the flexor tendons are usually discussed in terms of zones, shown in the image below. The 5 flexor tendon zones are modifications of Verdan's original work, which based zone boundaries from distal to proximal on anatomic factors that influenced prognosis following flexor tendon repair. The 5 zones discussed below apply only to the index through small fingers—separate zone boundaries exist for the thumb flexor tendon. Zones of the hand. Note the relationships to the underlying structures. Zone I consists of the profundus tendon only and is bounded proximally by the insertion of the superficialis tendons and distally by the insertion of the flexor digitorum profundus (FDP) tendon into the distal phalanx. Zone II is often referred to as "Bunnell's no man's land," indicating the frequent occurrence of restrictive adhesion bands around lacerations in this area. Proximal to zone II, the flexor digitorum superficialis (FDS) tendons lie superficial to the FDP tendons. Within zone II and at the level of the proximal third of the proximal phalanx, the FDS tendons split into 2 slips, collectively known as Camper chiasma. These slips then divide around the FDP tendon and reunite on the dorsal aspect of the FDP, inserting into the distal end of the middle phalanx. Zone III extends from the distal edge of the carpal ligament to the proximal edge of the A1 pulley, which is the entrance of the tendon sheath (see the A1 pulley in the image above). Within zone III, the lumbrical muscles originate from the FDP tendons. The distal palmar crease superficially marks the termination of zone III and the beginning of zone II. 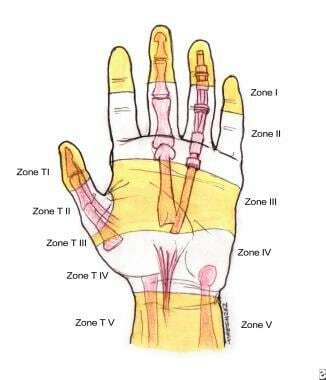 Zone IV includes the carpal tunnel and its contents (ie, the 9 digital flexors and the median nerve). Zone V extends from the origin of the flexor tendons at their respective muscle bellies to the proximal edge of the carpal tunnel. The digital flexor sheath is a closed synovial system consisting of membranous and retinacular portions. The membranous portion is made up of visceral and parietal layers that invest the flexor digitorum profundus (FDP) and flexor digitorum superficialis (FDS) tendons in the distal aspect of the hand. The retinacular component consists of tissue condensations arranged in cruciform, annular, and transverse patterns that overlie the membranous, or synovial, lining. Membranous portion of the flexor tendon sheath. The digital flexor sheath has been proposed to have a 3-fold function, as follows: (1) it facilitates smooth gliding of the tendons; (2) the retinacular component acts as a fulcrum, adding a mechanical advantage to flexion; (3) it is a contained system, or bursa, with synovial fluid bathing the tendons and aiding in their nutrition. The retinacular portion, or pulley system, of the flexor tendon sheath has been described extensively. Doyle described this pulley system as fibrous tissue bands of various width, thickness, and configuration that overlie the synovial sheath. The pulley system is thought to consist of the palmar aponeurosis (PA) pulley, 5 annular pulleys, and 3 cruciform pulleys. (See the image below.) The system supplies mechanical advantage by maintaining the flexor tendons close to the joint's axis of motion. In doing so, the pulleys prevent bowstringing, which makes up interphalangeal and metacarpophalangeal (MCP) joint motion. Retinacular portion of the flexor tendon sheath (pulley system). The PA pulley consists of transverse fascicular bands arising from the PA. The bands are approximately 1 cm in width, and the proximal edge of the pulley is 1-3 mm proximal to the origin of the membranous tendon sheath. The distal edge lies approximately 8-10 mm from the proximal edge of the first annular pulley. The PA pulley is anchored by vertical septa that attach to the deep transverse metacarpal ligament beneath the tendons. This pulley is not as closely applied to the surface of the flexor tendons as the annular and cruciate pulleys. However, during the act of grasping, increased tension on the palmar fascia by the flexor carpi ulnaris and palmaris longus muscles moves the pulley closer to the tendon surface. Strauch and de Moura described the membranous synovial lining as a closed mesenteric system that resembles those of the abdominal and thoracic cavities more than those of a joint space. Furthermore, the cul-de-sacs between the retinacular pulleys allow for contraction and expansion of the entire system as the digits respectively flex and extend. With respect to the function of the retinacular system, Doyle described 3 key anatomic adaptations that prevent buckling of the entire system during flexion: (1) the broad A2 and A4 pulleys are located between joints, whereas the narrow A1 and A3 pulleys are positioned over joints; (2) an anatomic accommodation always exists between the A1 and A2 pulleys; (3) the thin and narrow cruciform pulleys are located near joints where they are able to accommodate flexion more readily than the larger annular pulleys can. Manske and Lesker described the functional anatomy of the proximal pulley system in terms of total range of motion of digital flexion. The PA, A1, and A2 pulleys of each individual digit in 12 cadaver hands were cut sequentially. The total loss in range of motion was then calculated for the various permutations of remaining pulleys. In terms of functional significance, Manske and Lesker found that the A2 pulley was the most important, followed by the A1 and PA pulleys, respectively. However, loss of flexion with a missing A1 or A2 pulley was proven to be insignificant in the presence of an intact PA pulley. With the absence of an A1 or A2 pulley, loss of flexion was significantly greater when combined with loss of the PA pulley, leading the authors to conclude that the PA pulley should be spared at all costs when repairing hand injuries. From their musculotendinous origin to the level of the A1 pulley, the flexor tendons receive their blood supply from the surrounding paratenon—a filmy layer of connective tissue that invests the tendon. The vascular supply is positioned primarily within the dorsal surface of the tendon; segmental blood vessels arise within the connective tissue, enter the tendon, and run longitudinally between tendon fascicles to supply nutrients. The flexor digitorum superficialis (FDS) muscles and the FDS tendons are known to have an overlying avascular segment at the level of the proximal phalanx. The flexor digitorum profundus (FDP) has an additional avascular zone at the level of the middle phalanx. However, when the tendons enter the flexor sheath, they are no longer surrounded by paratenon but are incorporated within the visceral lining of synovium instead. Blood vessels are rarely, if ever, seen surrounding the tendons within the sheath. Within the sheath, the only connection between the tendons and the periphery is at the level of the vincula, which are folds of mesotenon that carry a blood supply to the tendons within the sheath. A number of variations exist, but most commonly, each tendon within the sheath is supplied by 2 vincula, 1 long (vinculum longum) and 1 short (vinculum breve). 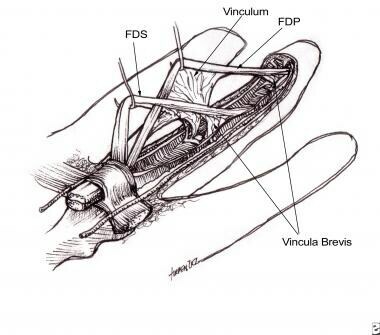 The FDS receives a short and long vinculum at the level of the proximal interphalangeal (PIP) joint. The FDS receives a long vinculum at the level of the PIP joint, and the FDP receives a short vinculum at the level of the distal interphalangeal (DIP) joint. In addition, each vinculum is supplied by a transverse communicating branch of the digital arteries. Within the flexor sheath, the tendons are also known to receive a significant amount of nutrition by diffusion from the surrounding synovial fluid. Since the turn of the 21st century, controversy has existed as to which method, diffusion or perfusion, is more important for tendon nutrition and healing. Currently, diffusion is thought to be a more important pathway than perfusion. Bojsen-Moller F, Schmidt L. The palmar aponeurosis and the central spaces of the hand. J Anat. 1974 Feb. 117(Pt 1):55-68. [Medline]. [Full Text]. Canuto HC, Oliveira ML, Fishbein KW, Spencer RG. Tendon and neurovascular bundle displacement in the palm with hand flexion and extension: an MRI and gross anatomy correlative study. J Magn Reson Imaging. 2006 May. 23(5):742-6. [Medline]. Fahrer M. The proximal end of the palmar aponeurosis. Hand. 1980 Feb. 12(1):33-8. [Medline]. Idler RS. Anatomy and biomechanics of the digital flexor tendons. Hand Clin. 1985 Feb. 1(1):3-11. [Medline]. Mester S, Schmidt B, Szabo G. Biomechanics of the membranous flexor tendon sheath: the role of Grayson's ligaments. Plast Reconstr Surg. 2006 Feb. 117(2):497-506. [Medline]. Barton NJ. Experimental study of optimal location of flexor tendon pulleys. Plast Reconstr Surg. 1969 Feb. 43(2):125-9. [Medline]. Hunter JM, Cook JF, Ochiai N. The pulley system. Proceedings of the American Society for Surgery of the Hand. Orthop Trans. 1980. 4:4. Li ZM, Tang J, Chakan M, Kaz R. Complex, multidimensional thumb movements generated by individual extrinsic muscles. J Orthop Res. 2008 Sep. 26(9):1289-95. [Medline]. Nimbarte AD, Kaz R, Li ZM. Finger joint motion generated by individual extrinsic muscles: A cadaveric study. J Orthop Surg. 2008 Jul 11. 3:27. [Medline]. Arora R, Fritz D, Zimmermann R, et al. Reconstruction of the digital flexor pulley system: a retrospective comparison of two methods of treatment. J Hand Surg [Br]. 2007 Feb. 32(1):60-6. [Medline]. Chin KF, Khalid M, Gogi N, Fussey J, Shanahan D, Deshmukh S. The mend of the bend-flexor pollicis longus tendon has an additional pulley distal to its point of angulation. Clin Anat. 2008 Jul. 21(5):427-32. [Medline]. Dona E, Walsh WR. Flexor tendon pulley V-Y plasty: an alternative to pulley venting or resection. J Hand Surg [Br]. 2006 Apr. 31(2):133-7. [Medline]. Hazani R, Engineer NJ, Zeineh LL, Wilhelmi BJ. Assessment of the distal extent of the A1 pulley release: a new technique. Eplasty. 2008 Aug 22. 8:e44. [Medline]. Kleinert HE, Lubahn JD. Current state of flexor tendon surgery. Ann Chir Main. 1984. 3(1):7-17. [Medline]. Lister G. Indications and techniques for repair of the flexor tendon sheath. Hand Clin. 1985 Feb. 1(1):85-95. [Medline]. Strickland JW. Flexor tendon injuries. Part 1. Anatomy, physiology, biomechanics, healing, and adhesion formation around a repaired tendon. Orthop Rev. 1986 Oct. 15(10):632-45. [Medline]. Strickland JW. Flexor tendon repair. Hand Clin. 1985 Feb. 1(1):55-68. [Medline]. Verdan C. Reparative surgery of flexor tendons in the digits. In: Verdan C, Boyes JH, eds. Tendon Surgery of the Hand. New York, NY: Churchill Livingstone. 1979:57-66. Verdan CE. Half a century of flexor-tendon surgery. Current status and changing philosophies. J Bone Joint Surg Am. 1972 Apr. 54(3):472-91. [Medline]. Zidel P. Zidel P: Tendon healing and flexor tendon surgery. In: Aston SJ, Beasley RW, Thorne CHM, Grabb WC, Smith JW, eds. Grabb and Smith's Plastic Surgery. 5th ed. Baltimore, Md: Williams & Wilkins. 1996:875-82. Moore KL. The upper extremity. In: Moore KL. Clinically Oriented Anatomy. 3rd ed. Baltimore, Md: Williams & Wilkins. 1992:553-606. Verdan CE. Primary repair of flexor tendons. J Bone Joint Surg Am. 1960 Jun. 42-A:647-57. [Medline]. Cohen MJ, Kaplan L. Histology and ultrastructure of the human flexor tendon sheath. J Hand Surg [Am]. 1987 Jan. 12(1):25-9. [Medline]. 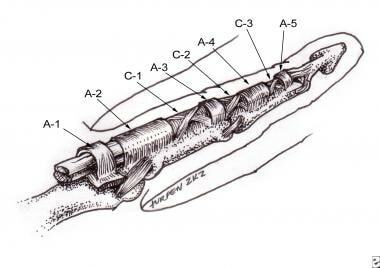 Doyle JR. Anatomy of the finger flexor tendon sheath and pulley system. J Hand Surg [Am]. 1988 Jul. 13(4):473-84. [Medline]. Doyle JR. Anatomy of the flexor tendon sheath and pulley system: a current review. J Hand Surg [Am]. 1989 Mar. 14(2 Pt 2):349-51. [Medline]. Doyle JR. Anatomy and function of the palmar aponeurosis pulley. J Hand Surg [Am]. 1990 Jan. 15(1):78-82. [Medline]. Doyle JR, Blythe WF. Anatomy of the flexor tendon sheath and pulleys of the thumb. J Hand Surg [Am]. 1977 Mar. 2(2):149-51. [Medline]. Bunnell S. Repair of tendons in the fingers and description of two new instruments. Surg Gynecol Obstet. 1918. 26:103-10. Strauch B, de Moura W. Digital flexor tendon sheath: an anatomic study. J Hand Surg [Am]. 1985 Nov. 10(6 Pt 1):785-9. [Medline]. Manske PR, Lesker PA. Palmar aponeurosis pulley. J Hand Surg [Am]. 1983 May. 8(3):259-63. [Medline]. Stewart DA, Smitham PJ, Gianoutsos MP, Walsh WR. Biomechanical influence of the vincula tendinum on digital motion after isolated flexor tendon injury: a cadaveric study. J Hand Surg [Am]. 2007 Oct. 32(8):1190-4. [Medline]. Azar CA, Culver JE, Fleegler EJ. Blood supply of the flexor pollicis longus tendon. J Hand Surg [Am]. 1983 Jul. 8(4):471-5. [Medline]. Manske PR, Lesker PA. Flexor tendon nutrition. Hand Clin. 1985 Feb. 1(1):13-24. [Medline].